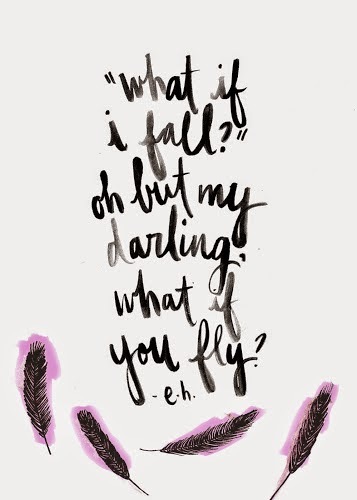 The Moy Life: What if You Fly? Three months ago I made quite a life changing decision. Might not equate to taking on a husband, but pretty close. It made me scared that I might fail. Scared that I was changing my path completely from what I had known for the past four years. I had been working in retail management for a little over 4 years. I had not planned on that path for myself but out of college I started part-time as I searched and searched for that full-time job. I was offered a promotion and gladly accepted it. And then another one. I enjoyed running my team, my area and thought, this is what I want to do. About a year ago, I lost the passion for what I did. I was no longer interested in doing what I showed up to work to do every day. I wasn't inspired or encouraged. More broken down and lost. Was this the path I still wanted? What other path was there for me? I had been out of college for about 4 years with little experience under my belt. A change had to be made. I knew that. Slowly but surely, I applied and applied. Interviewed and interviewed for different marketing/communications positions. Nothing. I got discouraged more times than I could count. Discouraged more than I could count. I took a hiatus for a few months but when summer came around it was time to kick the job search back into full gear. I didn't want to miss celebrations and special moments anymore. It works for some people, but it wasn't working for me anymore. Especially when you are on your anniversary trip and your husband tells you he loves Vacation Krista. Something had to change. It meant more interviews. More second interviews. More hope. Crushing "I'm sorry" emails. Low salaries that I couldn't accept. It turns out having a college degree and trying to change direction 5 years out of college does not equal out. Until, I was offered the job I have today. A job I wasn't sure if I wanted to accept but saw it as a step in the right direction. It combined my customer service experience with my marketing and social media skills. Within a week I went from 2 interviews to a job offer. Whirlwind to say the least. It was scary. It was nerve wracking. Was this the path I wanted to take? Would I fail? I went from an industry that I know quite a bit about and thrived in, to an industry I know very little about. Working in an office is something I never had the chance to do so even learning the proper email etiquette was necessary. Not to mention, I had no idea how to dress myself for an office. Thanks to my best friend and Pinterest I kind of caught on. Still have a long way to go. It's been a change but a good change. Have I been scared? Yup. Are there days where I am still not sure I made the right choice? Absolutely. But I also know I was meant to be here. For one reason or another. I'm on this path and I'm excited to see where it goes. 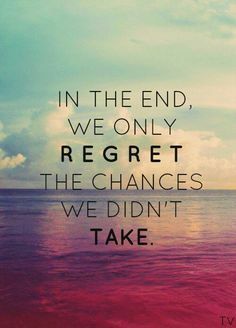 When have you taken a chance that absolutely scared you? I totally relate to this post. After I went to grad school, I worked specialty retail for over two years while I interviewed again and again and again, getting so close to my dream, but never quite making it. The perseverance will pay off, and it did for me - I am blogging and working my dream job @ the Y after many many years of trying for this position! Excited to see where this takes me! Oh girl I've been there too! It's scary but exciting. Best of luck to you! I LOVE THIS POST! You are SO awesome! It can be so scary to make those big changes, but it can also be so liberating and exciting! GO YOU!!! I'm so glad that you took the chance. It's so hard finding a new position when you're unhappy with what you're doing. I had a similar realization when Jake said something about how Vacation me was different than regular me as well... and that's a tough one to swallow. Your story is such an encouragement that I am going in the right direction. I know it will work out how it should! Thank you, I'm excited to see where it takes me! THANK YOU for being so encouraging and amazing! It really hits you when your husband says something so casual yet so raw to you. I knew it was time for a change and I'm excited to see where I fly to next! Awesome post...it take a leap of faith to realized that you could possibly be takented in another area. Im glad you decided to be brave! I really needed to read this today! Thank you for posting your feelings. I started a new job at the beginning of December and I still have days where I ask myself if I did the right thing. I think it was a good decision for my career and will pay off, but I'm struggling a little with it, and that is not normal for me. I'm not feeling like it's the right fit yet, I'm hoping with more time and as I learn more, things will get better and I will get more comfortable. But I need to take chances and make changes, even if they scare me. Those chances usually have the biggest pay-off! And I love the quotes you paired with this!